This is a blend of four brandies of the same year, the 1988 season. Brandy is produced from wine which, harvest by harvest, changes properties every time, due to the changing seasons. 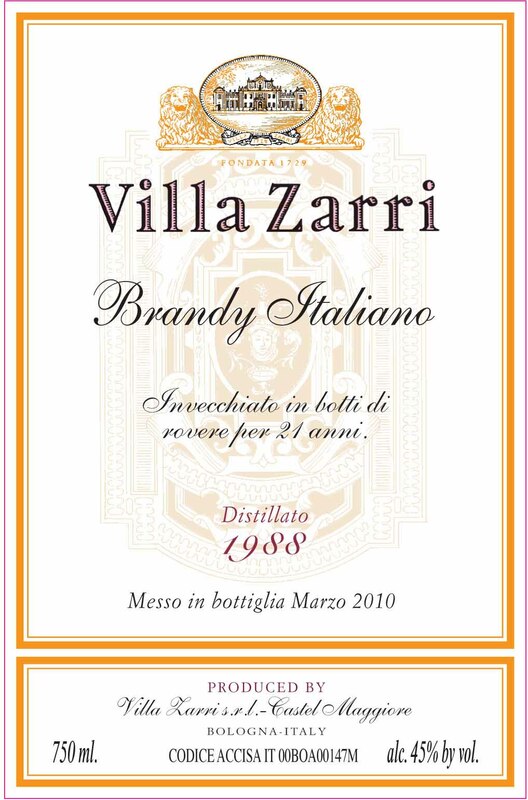 The idea of Brandy Millesimato (that is, vintage brandy) is therefore due to the intention of bottling a product endowed with the characteristics of a particular year. The wines used are Trebbiano Toscano and Trebbiano Romagnolo, distilled with a discontinuous method by means of a Charentais alembic which preserves all its best elements. Brandies are aged in small 350-liter oaken barrels made in France (Limousin and Allier.) During the first year of ageing new barrels are used in order to pass on to the distillate a certain color and certain tannins. Later on, the brandy is transferred into the so-called exhausted barrels, which are almost exclusively used for the tannin and alcohol oxidation process. During the ageing period, the alcoholic strength is reached, which in this case is 44%. A golden yellow color with amber highlights. A full and intense aroma with appealing shards of chestnut and arbutus honey. The smell unfolds revealing touches of sweet vanilla and woody liquorice root, arriving at wafts of leather and sweet tobacco. It taste expressed power and elegance.